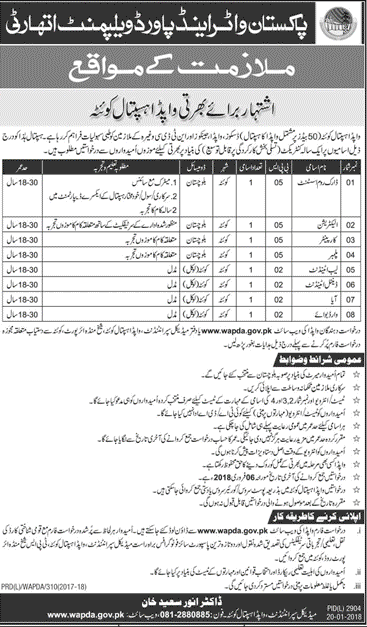 Government of the Baluchistan has announced 08 New Government Jobs in WAPDA Hospital Quetta. Jobs titles and number of posts are as follows, Dark Room Assistant (BPS-05) 01 Post, Electrician (BPS-05) 01 Post, Carpenter (BPS-05) 01 Posts, Plumber (BPS-05) 01 Post, Lab Attendant (BPS-02) 01 Post, Dental Attendant (BPS-02) 01 Post, AYA (BPS-02) 01 Post, Ward Boy (BPS-02) 01 Post. Recruitment is purely on one Year Contract Basis that may be extended. Candidates who have required Qualification and experience may apply for these Latest Government Jobs by sending their application to Medical Superintendent WPDA Hospital Quetta.